Imagine a situation where developers need to communicate with queue managers using programs. IBM MQ extends API support for Java developers to work with MQ in their applications. Benefit of using API is MQ SERVER not necessarily installed on the developer’s machine to communicate with IBM MQ Queue managers. 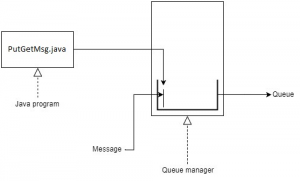 In this article we will see how we can write messages to the local queue and browse them back using Java. In order to manipulate a message queue first we should connect to a local queue manager using MQQueueManager class. A queue can be opened for various purposes such as put, browse, inquire etc. We specify our purpose of opening the queue by specifying Open Options. Opens the queue to get messages with exclusive access. If the queue is already in use, the call will fail. Opens the queue if it is already opened by some other application for retrieving messages. Opens queue with default queue attribute. Opens the queue to browse messages. In order to communicate with any queue, we need to supply queue name and open options along with it to the queue manager. Create an instance of MQMessage class, call writeString/wtriteUTF etc., supply your message as a string argument. That constructs a message. To put message into queue we need to pass our message and put message options as parameters to put method of MQQueue instance. To browse a message from queue, we need pass MQMessage object along with get message options object to the get method of MQQueue instance. Closing the queue after manipulating it is always a best practice. We should use close() method of MQQueue class to close a queue.